TRACKDOWN SYDNEY AUSTRALIA – Tim Carroll, Four time Emmy® Award winner, president and founder of Linear Acoustic, the leading authority in loudness control and upmixing solutions for digital television, will share his industry experiences and expertise during an industry presentation sponsored by SMPTE, on November 14th 2011. Tim Carroll was previously the Product Manager for the Professional Audio Division of Dolby Laboratories in San Francisco where he helped define and develop Dolby Digital (AC-3), Dolby E, and Dolby Surround products for High Definition Television, DVD, Digital Radio, and Digital Cinema applications in the U.S. and abroad. The National Academy of Television Arts and Sciences (NATAS) Prime Time Emmy® committee recognized his contribution to the creation of Dolby E and has recently been honored with the Chinese CRTA Scientific and Technical Innovation Award. Mr. Carroll remains actively involved in the creation of Digital Television standards and practices. He is a member of IEEE, AES, SBE, SMPTE, and the ATSC and participates as an observer in several international standards organizations including the EBU. For over 25 years Trackdown has been a leader in the audio post and music industry. Trackdown is Located within the Entertainment Quarter adjacent to Fox Studios Moore Park NSW. 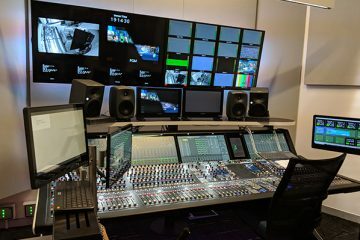 With humble beginnings as a rehearsal studio, Trackdown has grown to become a complete audio and music solution for the film, television, music and multimedia industries. With two studio locations including The Simon Leadley Scoring Stage (previously Trackdown Scoring Stage), Trackdown has the facilities to complete any audio or music project to a world standard. This night is for SMPTE Members and guests. We expect an early response with overall numbers limited, so be early with your RSVP. Entry is FREE and catering will be provided by SMPTE Australia. TRACKDOWN is an exciting venue and appropriate for our special guest. Access to Trackdown: Use the Entertainment Quarter Car Park, walk through the retail precinct, Trackdown is adjacent to the Australian Film Television and Radio School eastern end of the Entertainment Quarter. 6:45 – John Maizels overview of SMPTE and thanks. 7.00 – Introduction by Tim industry overview, History & reflection.